This is very interesting critical thinking puzzle which will challenge your brain. 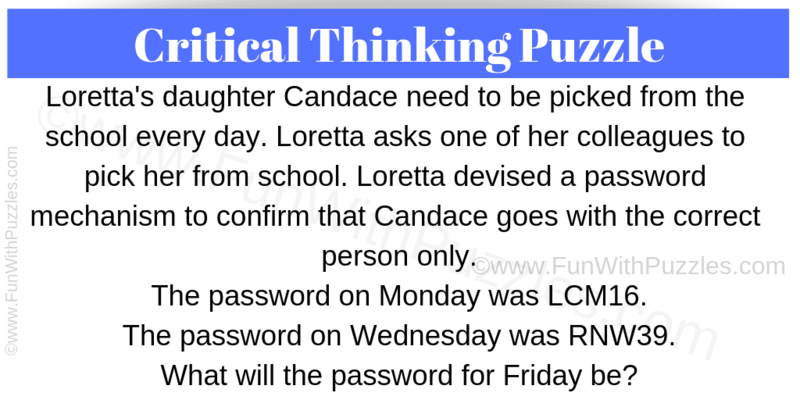 In this puzzle, mother Loretta and daughter Candace create a pass-code. This pass-code follows certain logical pattern. Try to decipher this sequence and find the code for the given days. Can you decipher the password? 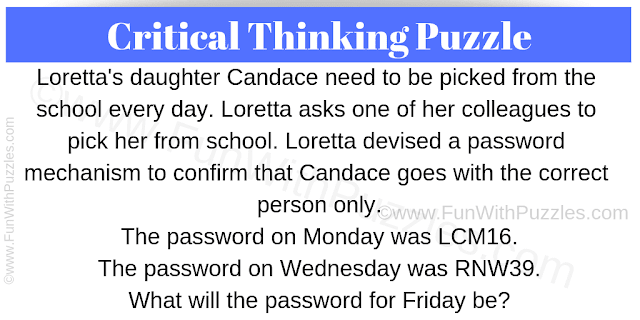 Answer of this "Critical Thinking Puzzle", can be viewed by clicking on answer button. Please do give your best try before looking at the answer. Friday is 5th day in the week. It is 6 letter long. 3rd letter is Friday's first letter which is F.
4th number is nth(5th in Friday's case) day of the week. 5th number is number of letters in the day. First two letters are nth (5th in Friday's case) letter of Mother's and Daughter's name respectively.